Supply chains around the world have evolved from simple procurement and payment relationships to tangled, complex webs. Over 820,000 Canadians are employed in supply-chain-related activities overseeing thousands of trade transactions at every step of the line. Managing supply chains is costly; supply chain costs are 79% of petroleum sales, 67% of vehicle sales, and aren’t much lower for anyone else. Adding additional costs and considerations on top of an already-complex process can seem like just too much… but implementing a sustainable, ethical supply chain for your imports is worth it in the long run. Ethical supply chains are ones that follow guidelines for reducing and eliminating forced and underage labour, and unsafe working conditions. Sustainable supply chains are ones that aim for reduced or net-zero carbon emissions. Ethical and sustainable supply chains have a clear positive impact on the bottom line. A tightly controlled, best-in-class supply chain nets companies 50% higher sales growth! The modern customer prefers to buy from brands that they know share their values. Ethical companies are seen as more meaningful, more engaged, and more caring. Governments and companies aren’t the only ones more aware than ever of ethical violations — customers are rightfully concerned that they’re not buying imports produced by slave labour. Sustainability is also a winner with customers who demand more accountability from the companies supplying their goods. By implementing a sustainable/ethical supply chain, you’ll signal to customers that they can trust your imported goods. 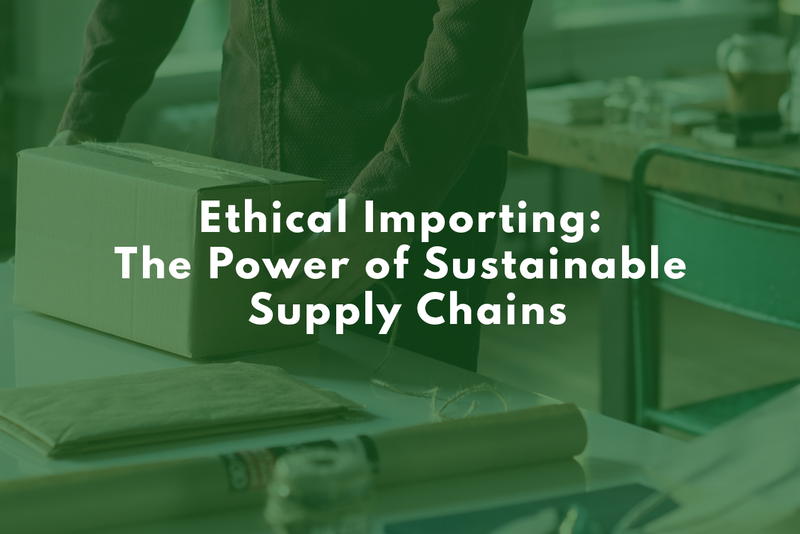 Ultimately, the number one reason why you should implement a more ethical supply chain is to be a better citizen of the world — but the material benefits are undeniable. In addition to hypothetical laws, rules and regulations are already governing some aspects of ethical supply chain procurement. The Canadian Government has already implemented its own enhanced requirements for importing clothing through its Acquisitions Branch, while the Retail Council of Canada (RCC) has a set of Responsible Trading Guidelines that Canadian retailers can adopt. Other guidelines include ensuring freedom to unionize, fair wages, and fair working hours. Member companies do not have to ensure all their imports follow these guidelines, so long as they’re transparent about what goods fall under the scope of RCC membership. Ethical supply chain management is getting easier; blockchain applications are increasing trade visibility, to look at one example. Sustainable technology and green innovation is rapidly becoming a major concern for customers and companies alike. Have you taken a look at your supply chain?